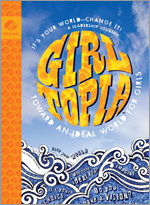 "GIRLtopia", Girl Scout Seniors know the world is not an ideal place. This journey for ninth-and-tenth graders is their chance to imagine a perfect world-for girls. They're invited to create their vision as an art project-in any medium of their choice. Then they'll take action to make their vision a reality. Leaders, after all, are visionaries! This book is 112 pages.